Endospore formation is usually triggered by a lack of nutrients, and usually occurs in Gram-positive bacteria. 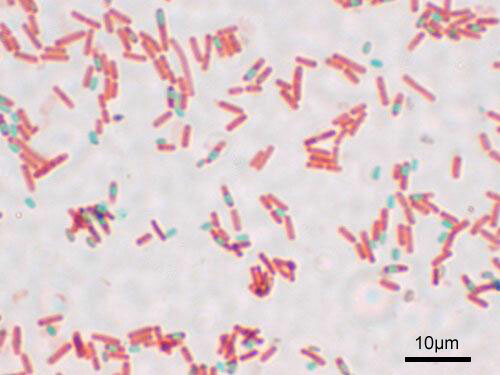 Examples of bacteria that can form endospores include Bacillus and Clostridium. Endospores can survive without nutrients. They are resistant to ultraviolet radiation, desiccation, high temperature, extreme freezing and chemical disinfectants. While resistant to extreme heat and radiation, endospores can be destroyed by burning or by autoclaving. endospore: A dormant, tough, and non-reproductive structure produced by certain bacteria from the Firmicute phylum. An endospore is a dormant, tough, and non-reproductive structure produced by certain bacteria from the Firmicute phylum. Endospore formation is usually triggered by lack of nutrients, and usually occurs in Gram-positive bacteria. In endospore formation, the bacterium divides within its cell wall. One side then engulfs the other. Endospores enable bacteria to lie dormant for extended periods, even centuries. When the environment becomes more favorable, the endospore can reactivate itself to the vegetative state. Examples of bacteria that can form endospores include Bacillus and Clostridium. The endospore consists of the bacterium’s DNA and part of its cytoplasm, surrounded by a very tough outer coating. Endospores can survive without nutrients. They are resistant to ultraviolet radiation, desiccation, high temperature, extreme freezing and chemical disinfectants. They are commonly found in soil and water, where they may survive for long periods of time. Bacteria produce a single endospore internally. Endospore morphology: Variations in endospore morphology: (1, 4) central endospore; (2, 3, 5) terminal endospore; (6) lateral endospore. Viewing endospores under the light microscope can be difficult due to the impermeability of the endospore wall to dyes and stains. While the rest of a bacterial cell may stain, the endospore is left colorless. To combat this, a special stain technique called a Moeller stain is used. That allows the endospore to show up as red, while the rest of the cell stains blue. Another staining technique for endospores is the Schaeffer-Fulton stain, which stains endospores green and bacterial bodies red. There are variations in endospore morphology. Examples of bacteria having terminal endospores include Clostridium tetani, the pathogen that causes the disease tetanus. Bacteria having a centrally placed endospore include Bacillus cereus, and those having a subterminal endospore include Bacillus subtilis. Sometimes the endospore can be so large that the cell can be distended around the endospore. This is typical of Clostridium tetani. When a bacterium detects environmental conditions are becoming unfavourable it may start the process of endosporulation, which takes about eight hours. The DNA is replicated and a membrane wall known as a spore septum begins to form between it and the rest of the cell. The plasma membrane of the cell surrounds this wall and pinches off to leave a double membrane around the DNA, and the developing structure is now known as a forespore. Calcium dipicolinate is incorporated into the forespore during this time. Next the peptidoglycan cortex forms between the two layers and the bacterium adds a spore coat to the outside of the forespore. Sporulation is now complete, and the mature endospore will be released when the surrounding vegetative cell is degraded. While resistant to extreme heat and radiation, endospores can be destroyed by burning or by autoclaving. Endospores are able to survive boiling at 100°C for hours, although the longer the number of hours the fewer that will survive. An indirect way to destroy them is to place them in an environment that reactivates them to their vegetative state. They will germinate within a day or two with the right environmental conditions, and then the vegetative cells can be straightforwardly destroyed. This indirect method is called Tyndallization. It was the usual method for a while in the late 19th century before the advent of inexpensive autoclaves. Prolonged exposure to ionising radiation, such as x-rays and gamma rays, will also kill most endospores. Endospores of the bacterium Bacillus anthracis were used in the 2001 anthrax attacks. The powder found in contaminated postal letters was composed of extracellular anthrax endospores. Inhalation, ingestion or skin contamination of these endospores led to a number of deaths. Geobacillus stearothermophilus endospores are used as biological indicators when an autoclave is used in sterilization procedures. Bacillus subtilis spores are useful for the expression of recombinant proteins and in particular for the surface display of peptides and proteins as a tool for fundamental and applied research in the fields of microbiology, biotechnology and vaccination.